No way! You went to the Orangette restaurant? Looking forward to the post! i love the postcard! i hope you are having fun 🙂 can’t wait to hear all about it! This is a very cool site and love all those recipes..want to try all of them! I hope you had a fabulous time. Can’t wait for your review. On a recent trip to Seattle for a postdoc interview, I dragged 4 local friends and my boyfriend to Delancey, and they were duly impressed (as was I). I have just recently discovered your blog- thanks to a link via bonappetit.com for your review of the Donut Man– I am a fellow Pasadena resident (Caltech grad student) and enjoyer of food (and long time Orangette fan), and I have been delighted to read your reviews of the local food scene! I intend it to guide diversity to my recently stagnant eating habits. Will you be going to her book signing in LA next week? Debutante Chocolate? Yum. 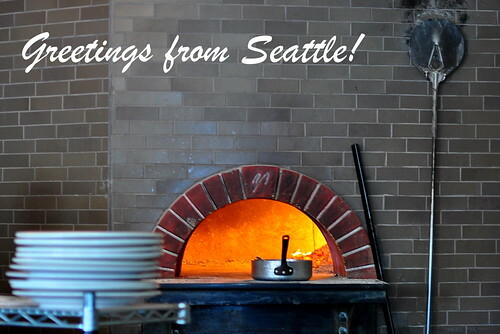 Seattle rocks – really. Looking forward to the post.